It was Kevin Olusola, or “KO” as he is referred to, http://kevinolusola.com/. His cello playing was astounding but when he added his beatboxing to it, it soared to beyond belief. Yesterday my and I attended a live simulcast from a christain college near us that featured him. Here is a u-tube link to Hallelujah if you want to hear them. This video will give you the chills. Kevin does not sing in this performance. Here is a short bio from his website. 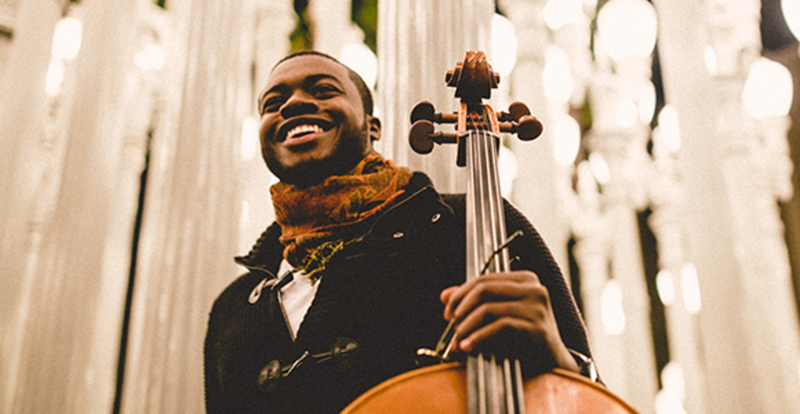 When it comes to breaking boundaries in the world of music, Kevin “K.O.” Olusola is no stranger. He is best known as the beatboxer of the Grammy-winning vocal quintet Pentatonix. Pentatonix’s most recent release, the platinum-selling album That’s Christmas to Me, was the #1 holiday album in the country and featured the title track written wholly by the group. The six videos in support of the holiday album – “Dance of The Sugar Plum Fairy”, “White Winter Hymnal,” “Winter Wonderland / Don’t Worry Be Happy” ft. Tori Kelly, “Mary, Did You Know?”, “Silent Night” and their original song and the title track, “That’s Christmas To Me” – have been viewed more than 64 million times. Pentatonix has also recently released PTX Vol. III, which has already released 4 music videos, yielding more than 45 million views. The group has eclipsed 7 million YouTube subscribers (more than both Avicii and Beyoncé), with more than 800 million cumulative views. Their music video for “Daft Punk” has been viewed more than 100 million times and the medley earned the group their first Grammy win. To date, Pentatonix has released 5 albums, each landing in the top 15 of Billboard’s Top 200 Album Chart and cumulatively selling roughly 1.7 million albums. Kevin grew up in the small town of Owensboro, Kentucky, the son of a Nigerian psychiatrist and a Grenadian nurse. At an early age, Kevin began learning piano, cello and saxophone. He performed at Carnegie Hall twice as soloist on the cello and saxophone and has appeared on NPR’s From The Top. After finishing high school at Phillips Academy Andover, Kevin enrolled in and graduated from Yale University where he was pre-med and majored in East Asian Studies. He spent 18 months in Beijing becoming fluent in Chinese as a part of his Yale fellowship. While in college, Kevin began developing his “celloboxing” skills and in 2009, he won second place in the “Celebrate and Collaborate with Yo-Yo Ma” international competition. Ma would call Kevin’s celloboxing version of “Dona Nobis Pacem” both “inventive and unexpected.” In 2011, Kevin’s “Julie-O” celloboxing YouTube video was featured by CBS, AOL, Huffington Post andWashington Post, among others. Kevin was also named one of 100 “History Makers in the Making” by NBC’s TheGrio and was hand-chosen by Quincy Jones to represent him in concert at the 2012 Montreux Jazz Festival alongside Bobby McFerrin and Chick Corea. While we were blown away by his talent, we were more impressed with this Christain testimony. He is a young man who has his priorities straight to the point that he does not perform any concerts during the Sabbath, which is Friday night at sundown until Saturday night at sundown because of his Seventh Day Adventist faith. He shared how for a few months he did until his sister brought him up short. He worried about what the group would think especially seeing as they had a concert coming up with no less a megastar as Kelly Clarkson. The group supported him one hundred percent and Kelly Clarkson worked around his Sabbath day by letting them perform before sundown on Friday night and after sundown that Saturday night. What a lovely person she must be. God clears a path when we remain true to our beliefs and this was proof. I felt encouraged that in this day of skepticism about Christianity there is a young man who is willing to live his beliefs. I felt encouraged by the fact that he was so young. I gave me hope. I learned I like “beatboxing”. A lot. Who would’ve thunk it? It’s so upbeat and fun. I’ve heard people do this before but never like this. And the cello? I don’t know about most cellists but him I loved. I can’t wait to download some of this music. It’s great when we learn something new. At least I think it is. But I almost forwent that opportunity as I really didn’t want to go. It was cold and I didn’t think I would ever like a live simulcast. But my husband insisted and I’m so glad he did. Today we’re attending another simulcast about the Broadway hit, “Hamilton”. It’s going to have to go some to beat “KO”. If you haven’t heard them or him in particular, check it out. You will be inspired. God bless and have a good day .